Question: Which Private Members’ Bill is expected to have its second reading debate in the House of Commons on Friday 25 January 2019? 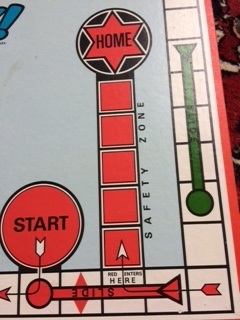 Clue: Long ago (1963), in the far-away suburbs of Oxford, when milk came in bottles, drinking water came only from the tap, and TVs were black and white, what could you watch on Christmas Day, sometime after Watch With Mother in the morning, and sometime before Sooty’s Christmas Party in the early evening? My story begins on Christmas Day , when after a dinner of chicken (bought frozen, with giblets inside which later on went into soup), and home-made Christmas pudding served with Birds custard, my father, my brother and I set out on the long walk across Oxford to visit my grandmother, who had a television set. There, sitting in front of the gas fire, balancing a splendid tea of chocolate finger biscuits and trifle on our knees, we settled down for the serious business of the afternoon, watching the Circus on TV. But this is a diversion from my opening question, to which the answer is: the Wild Animals in Circuses Bill 2017-19, a Private Members’ Bill, sponsored by Trudy Harrison. The Christmas story is a reminder of the plight of the homeless, and we are all used to the sight and sound of the Salvation Army bands performing and collecting money in the streets to support the destitute. 30 years ago, when I was working for Lovell, White & King, (thanks to whose generosity, Law was the first of the Bodleian Libraries to offer Sunday opening) I realised just how competitive the world of brass bands can be. The European Commission’s Decision in BBI/Boosey & Hawkes issued protective interim measures to ensure the survival of a new company making British style brass band instruments, following an allegation of breach of copyright. It may be the only time that a euphonium has been played in the corridors of the Berlaymont Building to demonstrate that distinctive British sound. 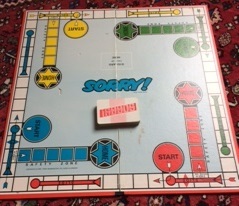 Moving from IP rights in the design of musical instruments to copyright in the actual music brings me to my favourite Christmas boardgame, Sorry … and to Justin Bieber, whom Casey Dienel claimed had used a loop from her song Ring the Bell in his song Sorry. It is fun to compare them. Skrillex and Bieber denied infringing copyright, posting a YouTube video to show how they arrived independently at an arguably somewhat similar sound. Their riposte is a neat reminder to us all of the importance of keeping careful records of both our sources and our methodologies. The best way to avoid accidental plagiarism is to reference fully and accurately at every stage of the research process; then, if the worst happens your careful records will demonstrate the honesty and originality of your work. Careful referencing and avoiding plagiarism are two sides of the same coin, which is why the Library combines them into one seminar that was offered several times in Michaelmas, and which we’ll be happy to run again on demand. Meanwhile, if you have any referencing questions, please remember that the Library staff is here to help you during the Vacation: we hope that all our readers will carry on referencing carefully over the Christmas holiday, and enjoy playing Sorry but not end up saying it! Here, to round things up, is link to a Salvation Army Euphonium Quartet. Happy Christmas everyone and a great start to 2018. On Wednesday Theresa May notified the President of the European Council, Donald Tusk, of the UK’s intention to leave the European Union. The six-page letter triggering the Article 50 process is here. And the response? Donald Tusk was clear: ‘There is no reason to pretend that this is a happy day, neither in Brussels, nor in London. After all, most Europeans, including almost half the British voters wish that we would stay together, not drift apart. As for me I will not pretend that I am happy today.’ Tusk’s sorrowful generosity of spirit is in sharp contrast with the triumphalism of some pro-Brexit supporters in the UK. David Davis’ Statement to the House of Commons (30 March 2017) on legislating for the UK’s withdrawal from the EU as a result of ‘last year’s instruction from the people of the United Kingdom’ (see it here or read it in Hansard) gave political sketch writer John Crace plenty of scope for wit. Following the statement, Keir Starmer opened the debate by quoting from the White Paper, ‘The Government proposes using existing types of statutory instrument procedure’ but pointing out: ‘There are no enhanced safeguards for that sweeping use of powers.’ He went on to argue that ‘there have to be clear principles for converting EU law into domestic law. All rights and protections derived from EU law must be converted into domestic law, with no limitations, no qualifications and no sunset clauses.’ In reply, David Davis, who gave somewhat dismissive responses to members of the House who had the temerity to question his Statement, seemed to imply that Starmer’s carefully worded contribution was disloyal to the interests of the UK. That was in Westminster. The following day, in Malta, Donald Tusk outlined the next steps from the point of view of the European Council. He outlined four issues for the first phase of negotiation: the status of EU citizens living in the UK; the need to prevent a legal vacuum for companies; the honouring of financial commitments, and the situation of Northern Ireland. Meanwhile, in another part of the EU, on 29 March the European Parliament (EP) had presented a draft motion for a resolution on the Brexit negotiations, which will be debated and voted on by the full house on Wednesday 5 April. Article 50 requires that the EP gives its approval to the final agreement, and its lead negotiator is MEP Guy Verhofstadt. The text of the draft motion sets out the conditions for a final approval by the EP of any withdrawal agreement with the UK. In its present form, it may not encourage the UK negotiators. Take, for example, paragraph 6: ‘[The European Parliament] Recalls that … it would be contrary to Union law for the United Kingdom to begin, in advance of its withdrawal, negotiations on possible trade agreements with third countries’. Paragraph 7 warns against bilateral agreements between the UK and individual EU member states that have not been agreed by all 27. This may not mesh well with Theresa May’s statement in her letter that ‘we believe it is necessary to agree the terms of our future partnership alongside those of our withdrawal from the EU’. The EP Statement of Positions is due in late April, and the Council’s Guideline on negotiation is scheduled for agreement at a meeting on 29 April. For a detailed account of the legal and procedural issues involved in the UK’s withdrawal from the EU, see here. The outcome negotiations may seem more immediately critical in some parts of the UK than others. Donald Tusk’s statement on 31 March noted the need to ‘seek flexible and creative solutions aiming at avoiding a hard border between Northern Ireland and Ireland’, and added, ‘It is of crucial importance to support the peace process in Northern Ireland.’ In Scotland, where Brexit has fuelled the pressure for a second referendum on independence, the Scottish Parliament has published Brexit: What Scotland thinks: summary of evidence and emerging issues. What’s next? A short video on the Council website sets out the process. Donald Tusk has already ruled out early negotiations on the UK’s future relationship with the EU: “Once, and only once we have achieved sufficient progress on the withdrawal, can we discuss the framework for our future relationship. Starting parallel talks will not happen.” The Timeline up to last Wednesday is here and the clock is ticking. Let’s hope that the UK does not end up like Larry the Cat, sitting on the wrong side of a closed door. Margaret Watson, EDC Librarian. 31 March 2017. What is the connection between the Human Rights Act 1998, the Crime and Disorder Act 1998 and Tom Jones? NO, this is not to do with changes in the law since novelist Henry Fielding worked as a magistrate among the criminalized poor of eighteenth century London, nor is it to do with the rights and wrongs of throwing your underwear at your favourite singer. This is to do with a Number One Christmas hit, the Green Green Grass of Home, and the abolition of the death penalty. The green of the grass, Mary’s hair of gold and lips like cherries … so far, so Christmassy. Green, red and gold evoke holly and ivy, berries and the Magi’s gifts, and returning home to the family home, particularly a Welsh family home, is a Christmas theme. The nostalgia draws us in, but there is a sting in the tail (or rather tale), signalled by the shift from song to spoken word, when we realise that it is about a condemned man, waiting for the guard and the ‘padre’ to take him to his execution. Christmas carols are not all cheerful either. The Sans Day Carol and the Holly and the Ivy associate red berries with blood, and the gold of kingship comes with myrrh, a reminder of death. Nevertheless, this was a strange song to be top of the pops at Christmas 1966. For where is the scene set? Logic suggests not in England or Wales, as the death penalty here was suspended in 1965 under The Murder (Abolition of Death Penalty) Act. The Act was the result of a Private Members’ bill, brought by Sydney Silverman MP, and in 1969, the abolition was made permanent. And how does what happened in the 1960s connect with two acts of Parliament in 1998? After 1969, the death penalty still remained a sentencing option in convictions for high treason and piracy with violence, and was only finally removed on 30 September 1998 by s.36 of the Crime and Disorder Act. This was necessary because the Human Rights Act 1998 incorporated the rights set out in the European Convention on Human Rights into British domestic law, and Protocol 13 of the Convention bans the death penalty in all circumstances, including for crimes committed in times of war and imminent threat of war. But there are many countries that the Convention doesn’t reach, and Amnesty International’s Review of the Death Penalty Worldwide makes shocking reading. Although, according to Amnesty, 102 countries had completely abolished the death penalty by the end of last year, there are still many parts of the world where Tom Jones’ prisoner could be awaiting execution, The Christmas story with the ensuing flight into Egypt tells of homeless and exile, and foretells death, so perhaps the Green Green Grass of Home was not such an inappropriate Christmas Number One in 1966 after all, and sadly, would not be inappropriate today either. (A traditional Czech Carol translated by Percy Dearmer). This traditional Czech carol, about a cuckoo, a pidgeon and a dove, reminds us of the importance of diversity in the bird population. The Birds Directive is a codified version of Directive 79/409/EEC, which is the EU’s oldest piece of nature legislation. This is the sort of thing that the EU can do very well: although birds are migratory, they are part of our shared heritage, and we need cross-border co-operation to protect them. The Czech Republic joined the EU in 2004. Percy Dearmer, the translator of this carol, lived for much of his life in London, but is also connected with Oxford where he read Modern History at Christ Church and was converted to socialism. He edited the Oxford Book of Carols published in 1928, and it is therefore particularly appropriate to commemorate him in a Christmas blogpost. Anne-Marie Carstens’ DPhil research focused on the development of international law governing the wartime protection of cultural property over the course of the past century. 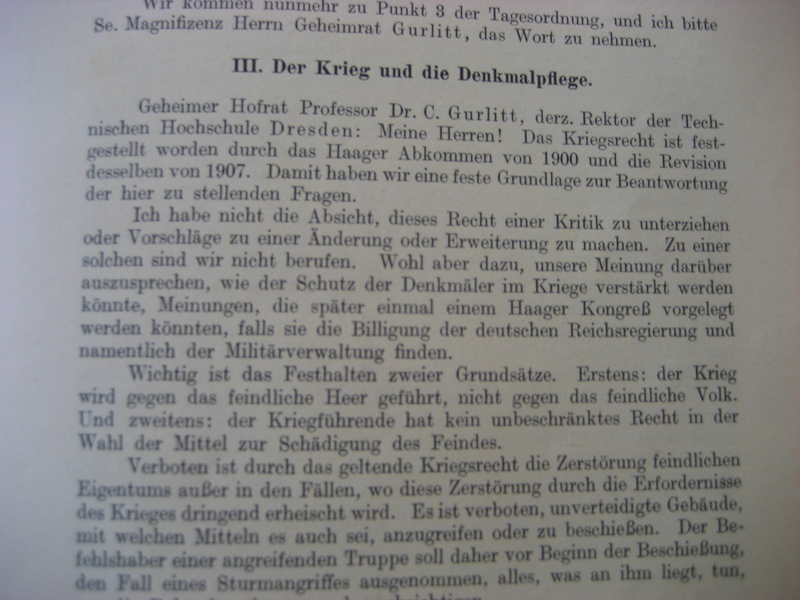 During her research, she found a passing reference in an old book to an international conference that was held in 1915, in the midst of World War I, which was dedicated to protecting cultural property during armed conflict–the first such international conference ever, and one generally ignored in the contemporary English-language literature. She therefore asked for help in obtaining a copy of a stenographic report through interlibrary loan, but when one could not be found, a member of the Library staff, Ronald Richenburg, tracked one down from a German antiquarian bookseller, and thanks to Helen Garner and AbeBooks, the Bodleian Law Library acquired it for the collection: Kriegstagung für Denkmalpflege: Stenographischer Bericht (Stenographic Report of the War-Conference for the Protection of Monuments). 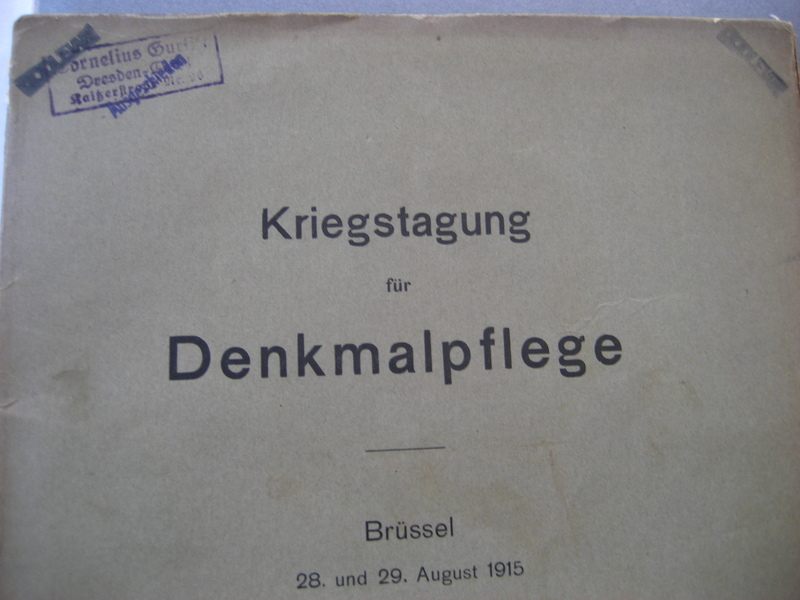 The report showed that German and Austro-Hungarian political and military leaders gathered in the hope of creating new rules to improve protection of cultural property in modern warfare, and they considered a few proposals, including one from leading art history professor Cornelius Gurlitt (not the one in this week’s news, but his grandfather). The secretive conference decided against a broader international conference at the last minute, given the wartime political conditions, which also ultimately led the conference to leave all the proposals on the table indefinitely. It nonetheless was an important historical event, and the copy obtained by the Bodleian Law Library was Professor Gurlitt’s personal copy, as indicated by the stamp on the book cover. And so, you can imagine Anne-Marie Carstens’ surprise at the irony: a century ago, a leading professor promotes a proposed international agreement for protecting art during war; his son becomes a major art dealer to Nazi leaders, and “comes into possession” of Nazi-seized masterpieces … and now his grandson of the same name has apparently been caught with an incredible treasure trove of major artworks lost from view since World War II. Very few copies of the report were circulated even at the time, given the secrecy surrounding the conference, and the Law Library is delighted that thanks to Anne-Marie Carstens’ research needs, we now hold a copy of this rare item. We hope that she will have the opportunity to publish her further research, elaborating on the conference and its relevance to the development of the law of war in the 20th century. (The Bodleian Law Library thanks Anne-Marie Carstens for her contribution to this blogpost). The Supreme Court of Canada and LexUM announced just before Christmas that the Court’s Decisions website now contains all decisions since 1907, and judgments in leave applications since 2006. The collection is updated within minutes of the public release of the judgments by the Court. The LexUM site has been the main public source for Supreme Court decisions for 20 years, and is a very useful resource if you are away from the Library, where you will find the Supreme Court Reports (S.C.R.) 1923 – shelved on the main floor at Cw Can 100 C90. For Oxford University staff and students, who have access to HeinOnline, Hein includes SCC decisions from 1876-2011 (as at January 2013). LexisLibrary carries Supreme Court of Canada Judgments from 1876 to date, and on Westlaw, the CANSCC-CS database contains the full text of documents of all reported Supreme Court of Canada cases, from 1876. To find out more about Canadian legal resources, you might like to use our Guide to Canadian Law. We ask: can this be legal?? 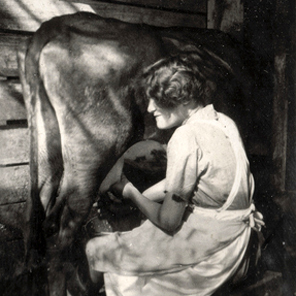 Are there no men employed in this dairy in which female staff toil … and are any women on the company board? I suspect the answer to both may be ”no”, but this may change … partly thanks to EU plans to increase the number of women directors. To find out more, go to the website of the European Commission’s DG for Employment, Social Affairs and Inclusion, follow the link to News, and scroll down to the news for 14 November 2012, you’ll see the headline Women on Boards: Commission proposes 40% objective. There’s a link to a press release, with further links to factsheets, and to a selection of key documents, which include a Press pack. 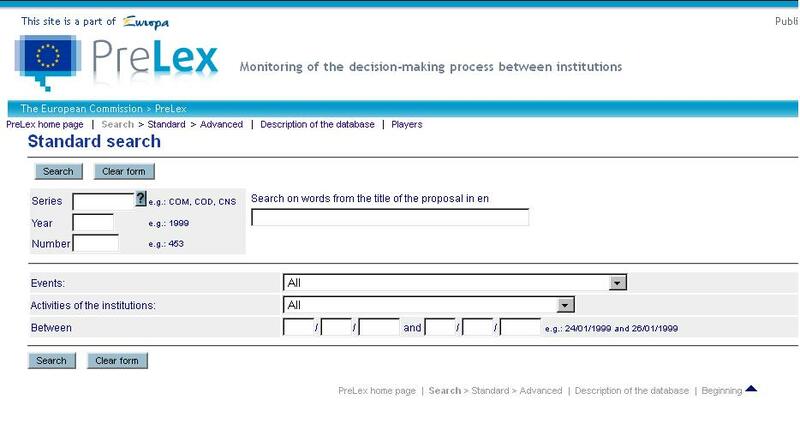 At the top of this screen you will see a Timeline, which shows how far the proposal has progressed, and on the left, there is a list of Events. As it is a new proposal, there is very little information there so far, but you can see that it is scheduled to be transmitted to the European Parliament on 16 December. But perhaps they are not the only hard-done by group: are there bands of frustrated men desperate to access milking work in dairies? Back to the DG Employment, Social Affairs and Inclusion homepage where we see a link to Rights at work. Follow the link for EU employment laws to find out whether there is a Directive in force on equal access to employment. If you scroll down the page on Employment and social policy you will see a link under Equality between men and women. Scroll down to the heading Female employment and entrepreneurship: employment below which you will see a link to Gender equality in the labour market. Here (at last!) is the link to the relevant Directive 2006/54/EC on the implementation of the principle of equal opportunities and equal treatment of men and women in matters of employment and occupation … and so our milkmaids may not make up 40% of the Dairy’s board, but they should have an equal opportunity to become goatherds … although that can be a lonely life … as Julie Andrews and the Muppets know. Check out the new Bibliography of the Council. Complied by the Commission’s Central Library it consists of around 730 records referencing around 260 books and 470 articles and selected chapters. References are grouped in specific research fields and indexed according to Eurovoc descriptors. The Central Library would be grateful if researchers would, by September 2012, test its usefulness against their needs and will welcome your comments on both the structure of the bibliography, and on any additional resources, particularly relevant literature in less widely-used EU languages and Master or PhD theses. What are JOIN and SWD documents? 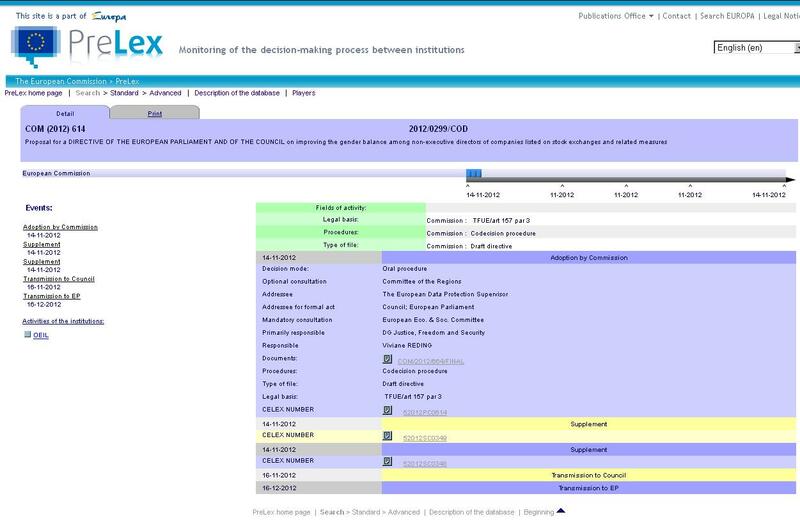 In January 2012, the European Commission introduced two new document identifiers, JOIN and SWD. JOIN is for joint proposals, communications, reports, white papers and green papers adopted by the Commission and the High Representative. SWD is for staff and joint staff working documents (impact assessments, summaries of impact assessments, staff working papers). It replaces SEC, which has traditionally indicated a document issued by the Commission’s Secretariat General. COM will still be used, but only for documents drafted by the Commission. The changes do not concern documents adopted before 2012. For more information, see EUR Lex newsletter 20 February 2012.